How did gay and lesbian couples’ right to marry go from unthinkable to inevitable? How did the individual right to bear arms, dismissed as fraudulent by Chief Justice Warren Burger in 1990, become a constitutional right in 2008? And what compelled President George W. Bush to rein in many of his initiatives in the war on terror before leaving office, even though past presidents have had a free hand in wartime? We are likely to answer that, in each case, the Supreme Court remade our nation’s most fundamental law. 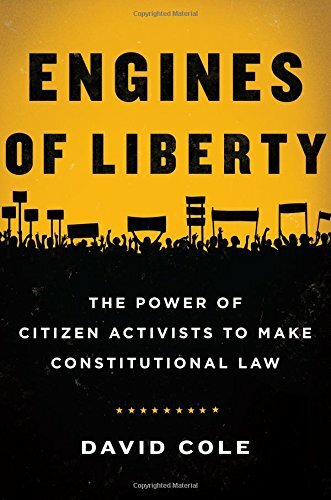 Yet as the award-winning legal scholar David Cole argues in Engines of Liberty, citizen activists are the true drivers of constitutional change. Drawing on interviews with participants in the most successful rights movements of the last 30 years, he shows that time and again, associations of ordinary Americans confronting long odds have managed to transform the nation’s highest law. And they have done so largely through advocacy outside the federal courts altogether. We witness marriage equality advocates in the 1980s and 1990s uniting behind a strategy of state-based incrementalism that paved the way for their historic Supreme Court victory. We see the NRA building a loyal and active membership base that can swing elections and influence state and federal law, thereby shaping the debate about guns at the Supreme Court. And we watch as civil liberties and human rights groups encourage foreign populations and governments to challenge the president when few domestic institutions would. Offering a new vision of the role we all play in shaping our Constitution and illuminating the tactics successful reform campaigns have employed, Engines of Liberty restores faith in the power of citizen activists to help shape our nation’s future.